These muffins are sooooooo delicious! The perfect winter treat….especially on a snowy morning, and especially with black coffee (Shhhhh). 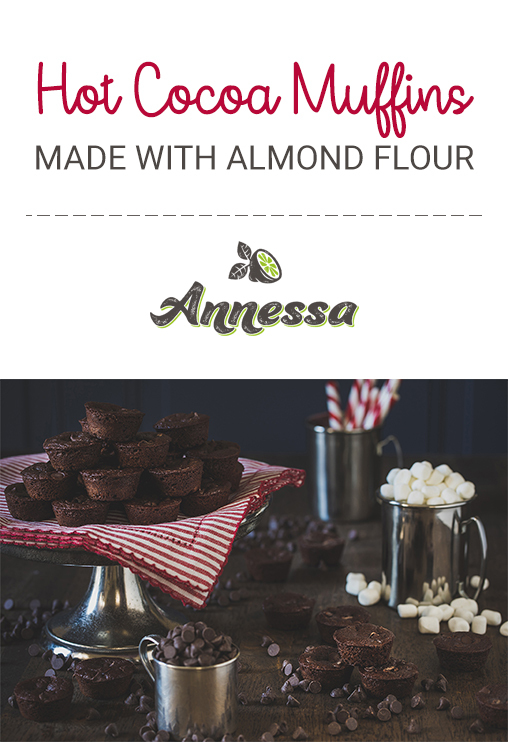 They are made with almond flour only – which makes them gluten-free, and higher in protein than usual as well. A good amount of cocoa powder adds to the rich “Hot Cocoa” flavor, but thankfully it is unsweetened, a good source of fiber, as well as antioxidants. These can be cooled and frozen for prepping breakfast ahead of time! I created this recipe for Albertsons Safeway. I hope you enjoy! 2. In a medium bowl, whisk eggs for 1 minute. Add the next 4 ingredients, whisking well. Add in almond flour, cocoa, baking powder, and salt, stirring well to combine all ingredients evenly. Pour in coconut oil while folding batter together. 4. Bake for 12 minutes, or until a toothpick inserted comes out clean. Remove and let cool. Enjoy! – muffins can be made ahead of time and frozen to have breakfast prepped and ready! To thaw, leave on the counter overnight or warm in the oven. Tried these this morning using plain Greek yogurt, very yummy!! They were very crumbly and hard to get out of the pan, but kids loved them anyway!